Bread pudding is a homey, comfort food dessert. Vegan bread pudding is easy and simple to make, and you probably have all or most of the ingredients in your cupboard or refrigerator already. If you have bread that is going stale, bread pudding is a great way to use it. Typical bread pudding includes eggs, cream, or milk, but you don't need any of these for a vegan version. This recipe is also low in fat, without any additional vegan margarine, oil, or egg replacer. If you want a splurge, top it with vegan rum sauce, which does include margarine, so you'll have eliminated the low-fat qualities of the dessert. But if you can handle the calories and fat, this makes a nice brunch dish to serve the family, especially during the holiday season. We also have several more variations on vegan bread pudding for you to enjoy. Reprinted with permission from The Compassionate Cook Cookbook. Put the bread into a 9-inch square baking pan. 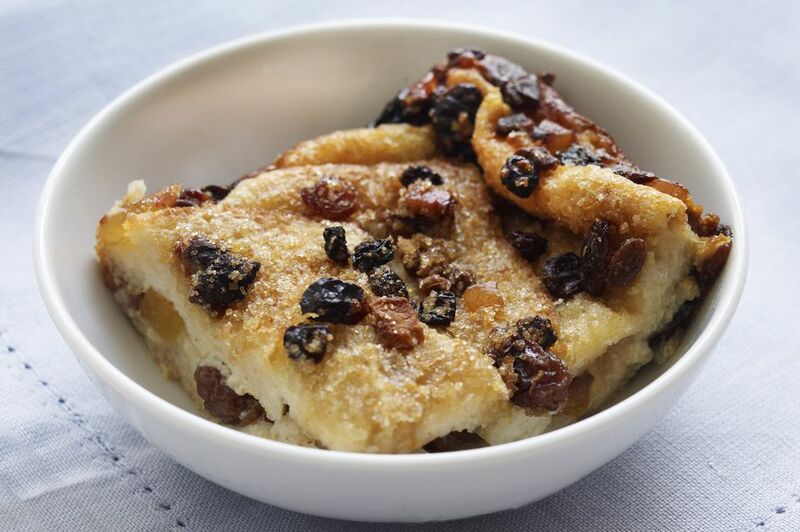 Stir the remaining ingredients together in a separate bowl (soy milk, sugar, vanilla, cinnamon, raisins, almonds). Pour the mixed ingredients over the bread. Stir to mix. Top with a dollop of vegan tofu whipped cream, vegan rum sauce, fruit compote, or sliced fresh berries.